From a snowy Antarctic landscape and dry African grasslands to tectonic plates rumbling beneath the planet's crust and meteorites whizzing through the atmosphere, children will be fascinated by the beauty of their home - our Earth!The unique design of the book allows children to discover a "hidden" image by holding the page up to a bright light. 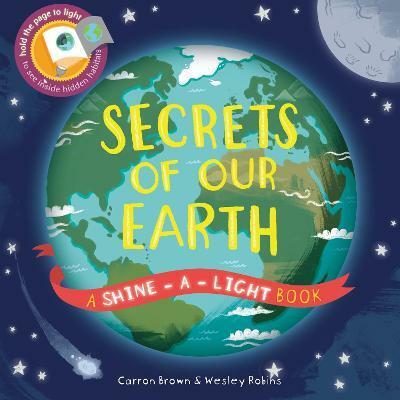 For children aged 3 and up, this is the perfect introduction to the hidden mysteries of our Earth. Carron Brown is a children's non-fiction editor and author based in London. She has been writing for more than 16 years and has written 12 books in the Ivy Kids Shine-a-Light series, which has over 1 million books in print. Wesley Robins is an illustrator and designer, based in London. He is the winner of the Macmillan Prize for Children's Book Illustration. Wesley has illustrated numerous books for Ivy Kids, including Great Art in 30 Seconds (2017) and Secrets of Animal Camouflage (2016).